A basic chicken roasting recipe with additional flavor from the lemon and lime juices and the white ground pepper. The chicken is moist and tender. It makes a good main course hot entree. It is also very good the next day when cold whether for a sandwiches of a chicken salad. Like the man said, “Set it and forget it,” or at least until it is time to eat. The instructions here are for a popular make of electric rotisserie. 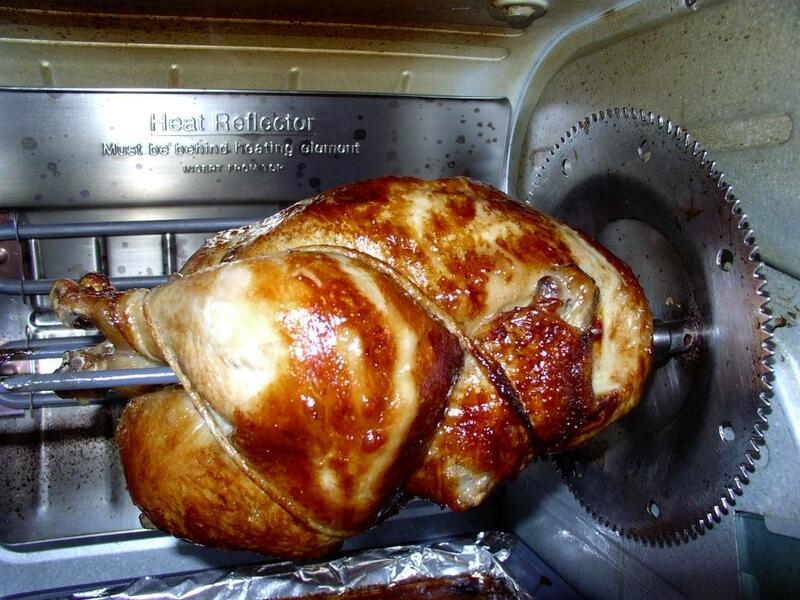 The bird can also be oven-roasted at 325° F, about 20 minutes per pound. Adjust procedure to meet any other manufacturer’s instructions. Wash chicken thoroughly, inside and out. Remove neck and organ meat from the cavity, reserve for other uses. Use scissors to remove wing tips at first joint. Remove tail and any skin flaps and fat at the cavity openings. Skin flaps, wing tips and tail can brush against the electric elements causing a fire. Use cotton string or elastic ties to truss the bird holding the wings firmly against the chest wall and the legs in line with the body. Rub the skin with vegetable oil. In a small bowl, mix the lemon and lime juices with the white pepper. Use a flavor-injector syringe to inject the mixture into both breasts and both thighs just above the knee joint. Place any left over mixture in the syringe and set aside. Slide the chicken onto the rotisserie tines. A spritz of non-stick vegetable spray will lubricate the pivot points and silence the squeak. Place the bird in the machine. After bird is level, empty contents of syringe into the cavity. Set the timer for 15 minutes per pound. Check the temperature with an instant read thermometer in the thickest part of the thigh. You need a temperature of 180° F to be fully cooked. After cooking, allow the bird to turn an additional 15 minutes with out heat or until juices stop flowing.